This is the best 43-inch Black Friday 4K TV deal so far | What Hi-Fi? Hisense’s H43AE6100UK 4K Smart TV: 'one of the cheapest and most cheerful 4K TVs around', as we stated in our four-star review of it. And now for Black Friday it’s even cheaper… and more cheerful for that? Anyone looking for a super-cheap, small 4K TV should certainly have a smile on their face. For Black Friday, Hisense has dropped the price of its H43AE6100UK from an attractive £329 to a drop-dead gorgeous £279. The offer ends when all the TVs have gone - and we've been told stock won't be replenished. So you might want to snap this one up sooner rather than later. Products don’t get a pass from us by simply being cheap, but even at its original price we didn’t think this Hisense a waste of money at all. Just don’t buy it for HDR content - the HDR performance is lacklustre. (Those after the HDR wow factor would be better off looking to the £360 50in Philips 50PUS6272, for example). 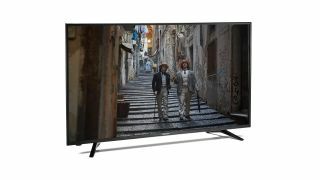 But when you’re looking to spend pittance, all you really need to know is that the Hisense handles the bread and butter of everyday watching impressively. Colours are decent, detail and sharpness are reasonable, and movement is no more juddery or blurry than that from many more expensive televisions. Room for a larger screen? The 50in version of this TV is now only £329. Got more money to spend? Check out these other juicy Black Friday TV deals.